Customer feedback is an important metric to gauge the quality of any product or service. But, for user reviews to establish any substantial conclusion, a high amount of reviews is required. Commonly referred to as the sample size, the number of people providing feedback has to be high enough to draw an honest picture of what is really going on. If 1000 people buy a product, but only 10 of them leave feedback, and 6 out of 10 happen to be negative, it is very possible that the majority was fully satisfied, and some isolated cases created a bad customer experience. Additionally, the age of the reviews also matter. Companies can go through growing pains and experience bad feedback on their first year, to bounce back better in the future. It also seems obvious that ILF Mobile Apps has been actively trying to counteract the negative feedback by posting overly positive fake reviews on the same websites. I found it very strange that after searching high and low, I was unable to find any users that we’re partially satisfied. 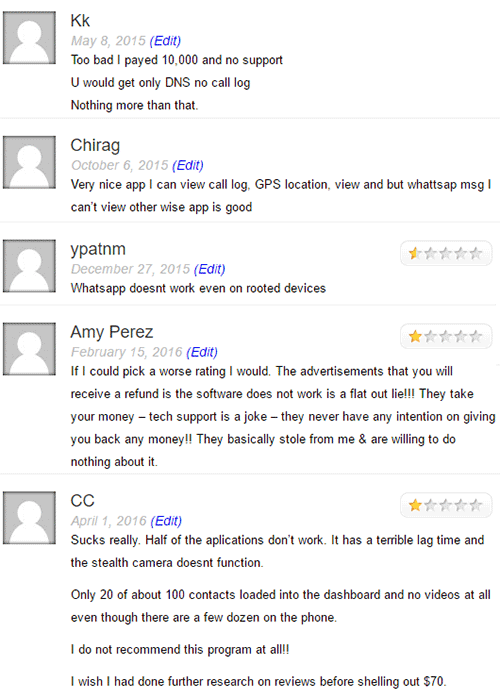 It was either they hated it because it did not work and no refund was provided, or they absolutely rave about it being the greatest monitoring app. That leads us to believe those positive reviews are all fabricated by them. We thoroughly tested all of ILF’s products, and there is no difference between them. Some features work, such as SMS text message logging, call logs, and browsing history. Apple’s iMessage also seemed to log properly. However, the majority of features only worked intermittently, or not at all. I have been unable to successfully log messages from instant messengers from Android or iOS iPhones. They claim to be able to track Facebook, WhatsApp, Instagram, Skype, BBM, and Viber, but the few times where it did capture something, it was never a full chat log. I take the time to properly test in every possible setting, by switching from mobile to Wi-Fi data, different locations, and multiple chat logs, shared pictures, and videos. When it came to any third party app, the service was horrendously bad. I was also unable to log any emails. After sending dozens of outbound emails, and receiving as many replies, not a single email from my test Gmail account was logged. As far as GPS tracking goes, it was a hit the majority of the time, but at times, it failed to properly report back even though I had a strong data signal. The tests were repeated on rooted Android devices and an iPhone with the same results. No Refunds – No Guarantees! 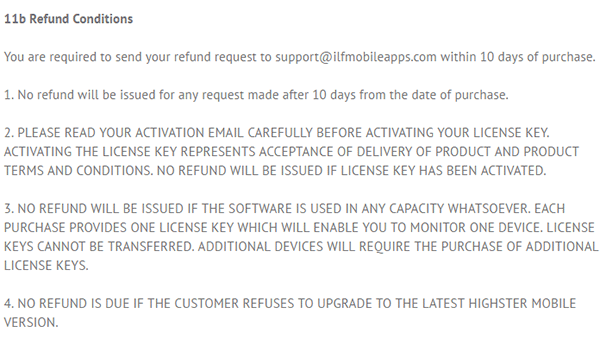 ILF Mobile Apps Corporation have the same service agreement for all of their apps. This service agreement states that they do not guarantee that ANY of their features work at intended, and that the service is sold “as is”. They make you agree to terms that state that regardless of how badly the service performs on your mobile device, they will never provide a refund. In fact, even if you never install or use their service, you are still not entitled to any kind of reimbursement. Even though they have a very strict, but none the less existing refund policy, they fail to honor it. One important thing to remember when using cell phone monitoring software, is that you’re trusting your service provider with the private data collected on those mobile devices. The text messages, recorded calls, pictures, videos, all of the monitored, and collected data gets uploaded to their servers, where you can access it online. This is not the same as smartphone app permissions, where you are asked permission to ‘share’ your contacts, or other devices, in order to use the apps’ features. These permissions do not take ownership of any of your private data to resell afterwards. This is really concerning coming from a service that logs and saves every single private communication made on the cell phone. Even worse, is the parents that have used these services, and had their children’s’ data possibly compromised. I think it is appalling that the service has ever collected data from underage minors using cell phones with their monitoring apps installed. Regardless of whether they still employ these practices or not, one thing for sure is that they have in the past, and I would not trust them for a second with any of my private data. These products are sold for a single payment usually ranging from $50 to $100, depending on the options you pick. They often sell an installation help call, which usually results being a bad experience as well. Unfortunately, these onetime payment options are simply not sustainable. In order for vendors to provide this service, they must upkeep private and secure server computers with lots of hard drives, employ technical support department agents, and customer service agents. Along with this, smartphones are advancing extremely fast, and they have to keep engineering new versions to remain compatible with the latest operating systems. All this costs lots of money, and man power, and that is why all legitimate cell phone tracking software vendors provide their services through a monthly or yearly subscription based model. To this day, I have not encountered one legitimate service that sells for a onetime only fee. Most of them are downright scams that possibly steal your credit card details, and never provide a real product in exchange. 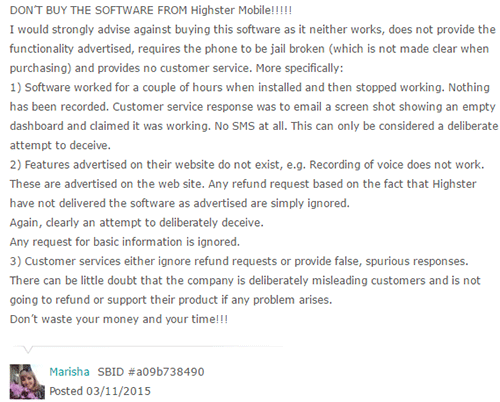 In Highster Mobile’s case, they do provide the software, but as we covered, it only partially works, but don’t expect any kind of real customer service, or technical support. Auto Forward Spy, and Easy Spy are sold exactly the same way, under the same terms. The same goes for SpyBubble, now defunct. Don’t expect them to give you much after sale value, or ensure that their services remain operational in the future. It can take days, even weeks before they actually respond to real concerns, unless you repeatedly contact them. They have a 1-800 number for ILF Mobile Apps, but it’s usually closed and directs you to voicemail. When the reception is available, they only direct you to contact technical support for any type of concern. You might ask yourself, if the service is so bad, and untrustworthy, why do so many online reviews rate them positively? Well, the short answer is because they are affiliated with them, and earn a hefty commission for every completed sale. We also have partnerships with some of the products we review, but we actually test every service, and provide a completely honest review of it. Therefore, no matter how large the payout, we will never advise you to buy bad, or unsafe software. What’s interesting, is that ILF Mobile Apps has been banned from selling their spying apps through popular affiliate marketing networks because of too many complaints, and chargeback disputes. Coming back to customer feedback, it was so bad, that affiliate networks could not deal with the refund requests, and had to boot them out! Legitimate and reputable affiliate marketing platforms employ high standards to ensure that all products sold meet a minimum level of quality. 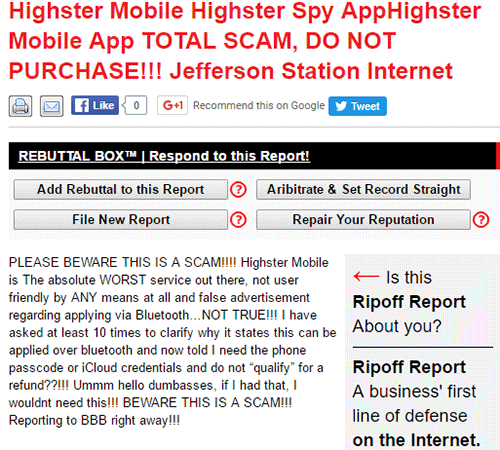 After careful inspection, I found one particular website that seemed to be completely sponsored by Highster Mobile, Auto Forward Spy, and Easy Spy. For the sake of transparency, that website is: “bestcellphonespyapps d-o-t-t -c-oomercial”. I refuse to link to them directly, but here is what I found on their site. They only highly score their own three apps, they claim that subscription based services are scams, and that you should only opt for single payment options. 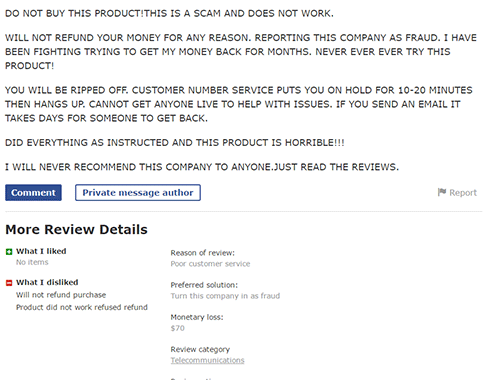 I also found lots of errors, or inaccurate information in their handful of reviews. They even go as far as claiming that using services like FlexiSpy requires a NASA certification to use. Really? What’s ironic is that these apps all work virtually the same way, and there’s really no difference between browsing one dashboard to another, other than whether or not the features work! Do I really need to say more? I feel that I can rest my case regarding this website’s lack of honesty towards their online visitors, with unethical biased reviews. I know money does not grow on trees, and if these one-time payment services were any good, I’d be happy to promote them as well. However, we made a collective decision to be honest on every review and website that we create. Therefore, the only valuable suggestion I have is to consider safer, and better options. Parents can use basic parental control services for something more light, but in general, all advanced cell phone spy software products are sold through monthly subscription pricing, and if you want something that works, and that won’t leave you feeling ripped off, learn all about the best services available and make an educated choice based on your needs and budget. Are there any known good software products that perform the same type of information gathering?